When I was a young trick-or-treater, one of the houses on our block was owned by a dentist. Instead of handing out Snickers bars or M&Ms like the other neighbors, Dr. Lloyd handed out mini-packets of baby carrots and toothbrushes. Needless to say, my friends and I always left his house wondering if his offerings were meant as tricks or treats. I’m still not entirely sure. My mother, of course, was thrilled that my brother and I had at least one healthy option among the heaps of Sour Patch Kids and Three Musketeers — candy we often didn't finish anyway, due to its sheer abundance and the common sense my parents instilled in us that candy bars were a special treat meant to be savored slowly, not eaten all at once. Now, with childhood obesity levels at all-time highs, many parents are rethinking the Halloween candy glut. That can be a challenge when kids have come to expect sugary treats as part of the trick-or-treat experience. Translation? Baby carrots aren’t going to cut it. But the choice doesn't have to be between baby carrots and Twizzlers. There are plenty of healthy treats that bridge the gap between outright health food and candy laden with high-fructose corn syrup. The trick, says Angela Lemond, spokesperson for the Academy of Nutrition and Dietetics, is making the healthy stuff look as appealing as the junk. Here are eight healthier options you can hand out on Halloween that kids might enjoy in addition to, or instead of, their surfeit of sugary candy. Given the persistence of urban myths about homemade treats — razor blades in apples, needles in candy — most parents still prefer for their kids to receive commercially packaged treats on Halloween, so those are the suggestions you'll find here. #(clear n1). Cereal or granola bars. Packed with whole grains, fruits, and nuts, cereal and granola bars can be a rich source of fiber and protein — and they taste great to boot! Go for a brand made with whole grains that doesn’t use high-fructose corn syrup, hydrogenated oils, or artificial flavorings and preservatives. If nut allergies are a concern, go for a nut-free brand. And gluten-free brands abound, including Lärabar, Glenny’s, and Kind. #(clear n2). Dried and freeze-dried fruit. Sweet on their own without any added sugars, dried fruits retain nearly all of the nutrients of their fresh counterparts. They are high in fiber and potassium, as well as other vitamins and minerals, like iron and vitamin A. Don’t limit yourself to mini-packs of raisins. Try small packs of dried apples, apricots, or cherries. If you’re looking for a crunchy treat, rather than a chewy one, go for freeze-dried fruit like apples, pears, or bananas, which offer the snap of a chip combined with the nutrition of dried fruit. Just make sure you choose a brand made without added sugars, colors, or preservatives. #(clear n3). Popcorn balls. Kids love popcorn, and the good news is that popcorn is a healthy snack for kids of all ages. It’s 100 percent whole grain and a good source of fiber, and recent studies have shown that popcorn is also high in polyphenols, antioxidants that prevent cell damage. To get into the trick-or-treat spirit, try handing out Halloween-themed popcorn balls, like those made by the Natural Candy Store. Sure, they’re sweetened with a light sugar syrup, but they’re a lot healthier than a bag of gummy worms or other artificially flavored treats. #(clear n4). Applesauce. High in vitamin C and low in calories, applesauce is a sweet, satisfying snack. If you’re worried kids will think plain old applesauce is boring, try a flavored version sweetened with fruit purées, such as strawberry or mixed berry. Better yet, choose a flavor with an orange tinge, like peach or mango, and dress up the containers with black ribbons to keep up with the Halloween theme. Whatever flavor you choose, make sure it’s sweetened with natural fruit purées and not added sugar or corn syrup. #(clear n5). Trail mix. Trail mix comes in all sorts of flavors, containing everything from peanuts to dried blueberries to chocolate chips, and packs a nutritional punch: fiber and protein from nuts, omega-3 fatty acids from ingredients like sunflower and pumpkin seeds, and potassium and iron from dried fruits. A little chocolate can add a healthy dose of antioxidants to the equation. Stick to dark chocolate, though, preferably in chip form, without any artificial colored coating. And read the ingredients list to make sure the mix isn’t laden with corn syrup and other sweeteners. If you’re looking for a nut-free brand, Enjoy Life makes two gluten-free trail mixes without nuts. #(clear n6). Peanut-butter-filled pretzels. On their own, pretzels may be low in fat and calories, but they’re pretty empty when it comes to nutrition, even when they’re made with whole-wheat flour. But throw a little peanut butter into the mix, and you get a sweet-and-salty combination of carbohydrates and healthy protein that tastes great and prevents spikes in blood sugar. Look for brands, such as Good Health, that steer clear of hydrogenated oils. #(clear n7). Graham crackers and whole-grain animal crackers. Though not exactly health food, graham crackers and animal crackers can still be moderately healthy when made with whole grains and without hydrogenated oils or artificial flavorings and preservatives. Annie’s Bunny Grahams come in snack-pack sizes and contain organic whole-grain wheat flour, graham flour, and corn flour. 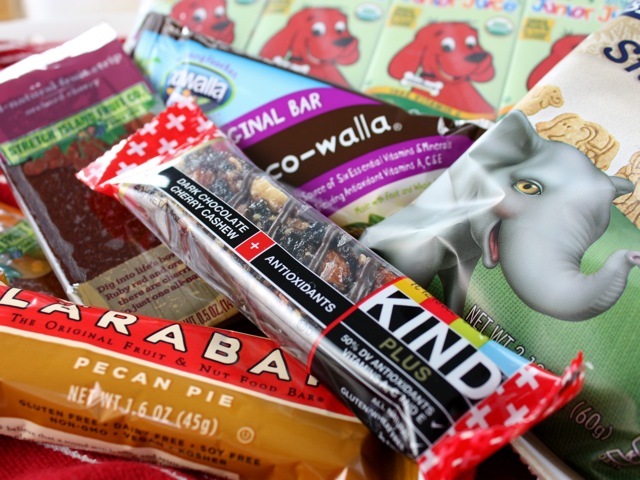 Barbara’s Snackimals come in several varieties, including a gluten-free version made with whole oats, and the packaging is fun and kid-friendly. #(clear n8). Juice boxes. Yes, this has the potential to rank up there with packages of baby carrots, in terms of excitement levels among kids. But after walking around the neighborhood for an hour or more, banging on door after door, kids get thirsty. Consider putting out an ice-filled tub of 100 percent natural juice boxes. Not only is fruit juice high in vitamin C, but it will quench the thirst of even the fussiest trick-or-treater. Whatever you hand out, both Castle and Lemond tell parents to remember that Halloween is just one day out of the year. There's nothing wrong with letting kids enjoy their Halloween spoils for a week or so. Once the holiday has disappeared in the rear-view mirror, any leftover unhealthy candy your kids bring home can vanish as well. p(bio). Dana Bate is a writer living outside Philadelphia. Her first novel, [%amazonProductLink asin=1401311008 "The Girls' Guide to Love and Supper Clubs"],_ will be published by Hyperion in February 2013.